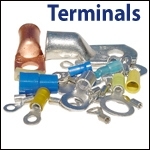 Electrical Terminals and Cables for Boats. Shop online at Apex Lighting for your next marine electrical wiring project. Apex Lighting offers a large selection of marine cables and terminals for your boat. 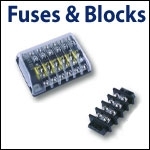 We carry cable and wire, terminals and connectors, fuse and terminal blocks, and much more for your boat or yacht. 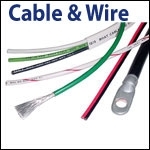 All of our marine cables and terminals are made of high-quality construction for durability. Shop online at Apex Lighting for all of the marine electrical cables and terminals you need to complete your project. We are proud to provide the best selection of high-quality LED boat lighting and marine-grade cables and terminals.